Here are some simple tips and tricks for how to thread a beading needle easily. Beading needles have tiny eyes. They’re about the same thickness as the needle itself. While this characteristic is great for making it easy to pass through beads, it’s quite difficult to thread the needle. But, threading your beading needle doesn’t have to be frustrating. Here are some tips and tricks to turn it into a much simpler process. This post contains affiliate links. If you click and make a purchase, there’s absolutely no extra cost to you. Read my full Disclosure Policy here. Both beading needles and thread come in a range of sizes and thicknesses. For needles, the larger the size, the thinner the needle is so a size 10 needle is thicker than a size 13. Boost your Right-Angle Weave skills with this easy-to-follow pattern. Simply sign up for weekly beading tips to have the bracelet tutorial sent straight to your email inbox. Thin needles are appropriate when working with tiny beads like 15/0 seed beads or when a pattern requires you to make several passes through the same beads. If you do need to use a thinner needle, stick to lower test weight thread e.g. 6lb. These are thinner and should be a little easier to pass through the needle eye. If you’re using a GSP thread e.g. Fireline or Wildfire, flatten the tip of the beading thread with a pliers or even your fingernails. When you look closely at a beading needle eye, it’s elongated, not round, so when you flatten your thread, it mimics the shape of the eye. It’ll be much easier to thread the needle. Alternatively, if using a nylon thread e.g. Nymo, you should condition the thread before you start working with it. Thread conditioners like beeswax help the fibers stick together allowing you to pass the end of the thread through the needle without it fraying. Just like you would use a needle threader when sewing, you can use one for beading too. Some needles like these even come with a threader. A word of caution when purchasing needle threaders: Make sure you get one that’s for use with beading needles. A threader meant for regular sewing needles may be too thick for beading needle eyes. Good lighting protects your vision when beading. Trying to slip thread into those needle eyes and staring at tiny beads can really take a toll on your eyes. Whenever possible, use daylight. Not only is this a strong light source but it’s the best type of light when selecting bead colors. If the room you bead in is dark or you enjoy beading at night, then make sure to use a bright lamp. Get one with a flexible neck so you can direct the light where it’s needed most. Another thing I highly recommend is using a solid colored background when threading a beading needle. It’s hard enough to see the needle eye and a multi-colored surface will only make that more challenging. Make it even easier to see the beading needle eye and tip of the thread by using a magnifying tool. These come in the form of standing magnifying glasses and even clip-on style lenses if you wear glasses. Whichever you choose, you’ll want something that’s hands-free since you’ll need both your hands to thread the needle. Most people thread their needles by trying to push the thread through the needle eye. Here’s an easy way to thread a needle. Flatten or condition your beading thread. Hold the thread between your thumb and index finger of your non-dominant hand, allowing just a couple millimeters to extend past your fingers. Then, slide the needle over the thread. If you’re still having problems after several attempts, turn the needle eye to the opposite side. Sometimes, one side of the needle is smoother than the other due to the manufacturing process. While I recommend brands like John James and Tulip beading needles, if all else fails and you really can’t thread these needles, use a Wide-eye needle. I personally don’t like them for beading because they’re too flexible for my taste. You can learn more about the Wide-Eye needles here. So, now you know how to make threading a beading needle easy. Try these five tips to figure out which one works best for you. Download this FREE bracelet pattern! Boost your Right-Angle Weave skills with this step-by-step pattern. Simply sign up for weekly beading tips to have this bracelet tutorial sent straight to your email inbox. 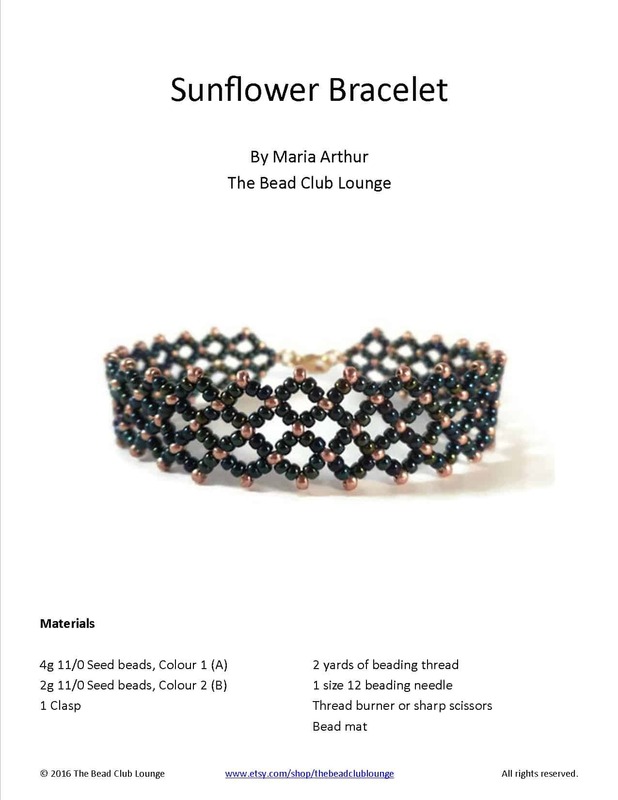 All the bead-weaving images on this website are copyrighted to The Bead Club Lounge and must not be copied or used without express permission from Maria Arthur. Simply sign up for weekly beading tips to have the bracelet pattern sent straight to your inbox.